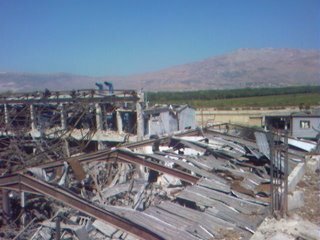 The images above are of the Maliban bottling factory in the town of Chtoura on the road to Damascus in Lebanon’s historic Bekaa valley. Or rather it was the Maliban bottling factory. Now it is a mess of twisted steel, broken glass and shattered concrete. I was there Tuesday on a two-day trip through the battered Bekaa returning Wednesday night. 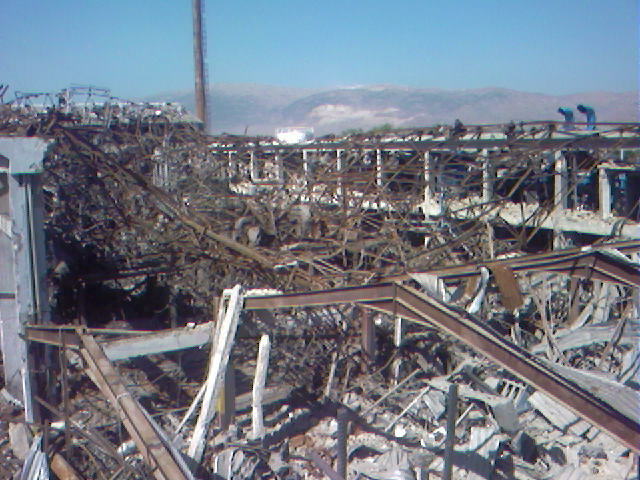 The destruction of this modern bottling plant was mind-blowing. All the more so as it is owned by British Indian family from Uganda, the Madhvanis. For 40 years they have invested in the plant, and the people of the Bekaa. 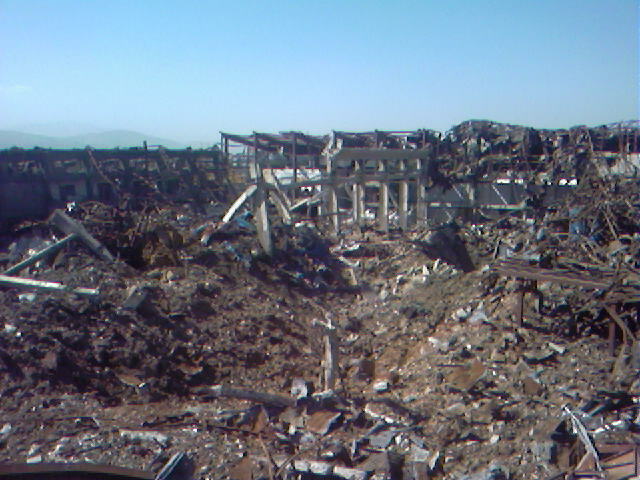 360 employees and their families lived from the factory. Now all are unemployed and one who happened to be in the factory at 12.35pm on August 4 when four massive Israeli missiles hit the building, is dead. The man in the picture above has managed the plant, which was one of the Lebanon’s biggest industrial enterprises exporting to the Middle East and Europe and turning over $26 million annually, for 34 years. His name is Aurobindo Roy Chowdhury. ‘We didn’t even hear the planes. 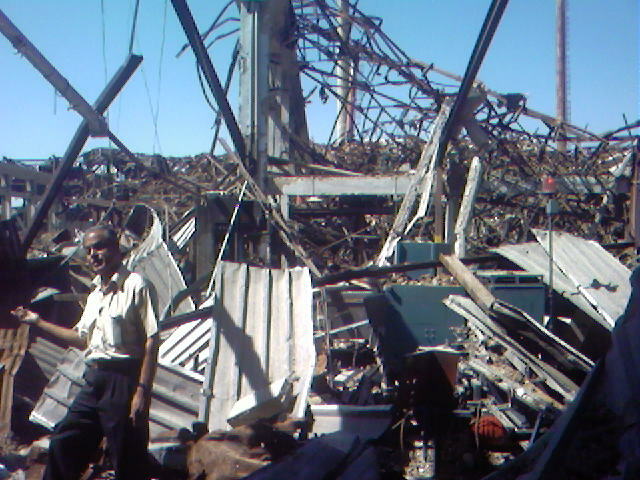 If I hadn’t closed for business three days earlier 150 staff could have been dead. It is a disgrace,’ he says. There is little doubt in Roy Chowdury’s mind, or Beirut Live’s, that this attack and the one on the Liban Lait milk factory halfway between Zahle and Baabeck (which produced exactly the same results as the pictures above) was designed to attack the people and damage Lebanon’s economy. ‘It would cost between $60 and $70 million to rebuild from here,’ he says, and there is no guarantee that the Madhvanis will do so considering the huge cost and the instability of the region. One man in the factory told me that Israel always wanted to hit Maliban as the Madhvanis had declined to open their business in Israel way back in the 1960s. What is certain is that this bombing which Israel has offered no concrete explanation for was designed to inflict maximum damage on the people of the Beqaa and any support they might have for Hizbullah and Sayed Hassan Nasrallah, as well as seriously harm Lebanon’s economy. The Israeli policy seems to have been (I say seems because Israel never ever takes responsibility for actions it knows to be reprehensible - eg. Rachel Corrie), ‘if we cannot destroy the magical guerillas lets harm business. 45 factories were hit during the July campaign. None were proved to have Hizbullah fighters or any weapons inside. At Liban Lait even the cows were not spared Israel’s wrath. And after 35 days of conflict no one has won anything and everybody has lost. There is little doubt that there was a major economic objective to this war. Hurt the nation’s business and financial status as much as possible, put economic pressure on the government and perhaps that will cause them to blame Hizbullah and fight them, seems to have been the Israeli aim. What others are there? And oh what a surprise… the British Government, in its duty to its citizens and business wherever they are, hasn’t even bothered to a lodge an official complaint to Israel. Carmel, Lilu, Jaeger - this is what I mean. No matter the argument, there simply is no way to justify this. Unless, of course, the description of the place is a lie. Israel throughout has said it used precision weapons to minimize "collateral damage." It has said "accidents happen" and, even, that it put its own troops in danger by announcing its targets in advance so "civilians" (which, I always thought mean "non-combatants") could get out of the way. I hope before the explanations and attempts at justification begin, people will take a breath and say something like, "my God - I had no idea." Hcb--there is no justification, unless as you said, the location is a lie or.... the IDF thought HZ would use the milk and bottles as weapons..or they mistakenly thought HZ disguised themselves as cows. "Peace" with an evil state like Israel is impossible. Lebanon must deploy sophisticated anti-aircraft weaponry to defend itself and then shoot the bastards down! Also the US Congress must stop sending military aid to Israel. I had no idea, but I wont pretend to be shocked. As I've already said, my problem with the IDF campaign all along was it's extent. I imagine that along with the intent to try and eliminate HZ by force once and for all which constituted alot of the fighting efforts and was legitimate, Olmert, Peretz and Halutz figured they would also throw in some scare tactics and maintain some long term political goals, to make the Lebanese turn on HZ and (something along the lines of "we'll show the Lebanese that if they don't take care of HZ themselves they will keep getting hurt - we'll do this by using brute force on them and they'll be so scared they will immediately go hang Nasrallah"). I don't know if this is over-estimating or under-estimating the Lebanese people, but it looks to be the same sort of information interpretation mistake as the failure to predict Hamas' rise to government. This is where the leadership was arrogant - it is unrealistic to cause damage to civilians and expect them to turn on someone else instead of you. doc, ..HZ disguised as cows? the IDF are not far from it...they stormed in a village in south Lebanon, among others, raided a 70 year old mans home, killed 2 women in the process (nothing new) and arrested the old man because he holds the name of "hassan nasralah" surely they thought he the real hassan nasralah disguised himself as an old man now that looks nothing like him do u think? oh! right, a "regrettable mistake" of course...we heard that one b4 right? the Red Cross that was also targeted by precision missiles, nasralah is now a red cross medic! And you demonstrate again, Lilu, why I think so highly of you. I hope the properly angry people on the other side of the border will also recognize it is NOT the case that all Israelis or all Jews are bad people. The real differences are matters of degree. If Hezbollah had an air force equivalent to the Israeli Air Force, we would be looking at pictures like this of Tel Aviv and Haifa. 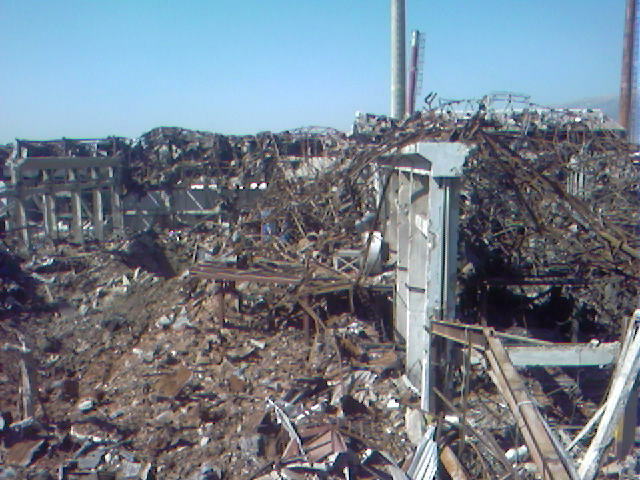 And if Iran gets an atomic bomb, we will be looking at worse. But the good people on each side don't want any of this. They get sucked along by their "leaders" and then get drawn into the horror. That creates the hate which continues to fuel the horror. Israel is doing internally - at this very moment - what Lebanon should be doing. Now is the time Lebanon should be showing the people of southern Lebanon that Hezbollah is a gang of murdering psychopaths. And Israel should be helping the Lebanese do that. Quickly. Because Hezbollah at this moment is using pictures like this to say, "do you see why we have to kill every Jew we can get our hands on?" Hezbollah is a gang of murdering psychopaths? I disagree HCB. Israel was on their land. They were defending their territory. They are psychos, but for other reasons, not because they wanted to defend themselves and their country. I do agree that the IDF tactics played right into HZ hands, as well as their supporters. Listen to you guys, here's a box of tissue's. Don't align yourselves with terrorists and this doesn't won't happen. Who's to say that HZ wasn't shooting missles from these locals. Maybe just maybe these companies also funded or supported HZ too which allows for there distruction just like the banks. But you guys know all so I'm sure my crack pipe is doing the talking. I’m sorry to have to apologize again for my yappy little Sammie doggie. He follows me around and then always gets so excited when he sees me that he runs in little circles with his little doggie legs pumping and his little doggie tongue flopping and drooling while he yips and yaps at my feet hoping I’ll pick him up. But, if I do, then he yips and cries even more when I put him down. He’s not very smart, I know, but he IS cute. Anyway – sometimes he gets so excited he even pees all over himself and on the floor. Don’t pay him a lot of attention. He eventually will wear himself out and go back under the bed to sleep. And, perchance, to dream. Americans should not waste time spewing rhetoric about "Hez murdering gang of psycopaths" and "do you see we must kill every jew we get our hands on". Use your precious time to begin educating yourselves about the continued cycle of violence. I visited Lebanon, stayed in the Dahiya and visited all over. These statements are simply not the truth and it hurts America to continue this path of thought. Those "psychopaths" have rolled up there sleeves and begun a system helping the people and cleaning up. FEMA could take a few lessons from the "pschopaths". Educate yourselves my dear fellow Americans, we must stop being the laughing stock of the world. We can no longer fund the autrocities shown in the pictures of this blogsite. We must find understanding and truth. You're right Doc - at the moment, Israel was and is on "their" land. But go back throught the "Time" article to which you referred me and the Hersh article we were talking about last week. Hezbollah is a long way from being pure - maybe "psychopath" is too harsh a term but I don't think so. I agree Hezbollah successfully baited Israel into doing what was done. That means Nasrallah is smarter than Olmert - tactically. But it also demonstrates Nasrallah's cynical disregard of the people he purports to be defending. It means he invited a war so he could show everyone just how brutal Israel is. But the invitation came at the expense of his own people. Especially if he planned the situation as I certainly believe he did - he is an egomaniac. He is smart and he is a lot of other things. But his concern for the people he purports to be defending is pretended. Of course you're right, I care. And I am not simply spewing rhetoric. Why would the Hezbollah dig the bunkers and prepare the thousands of rockets and fire on Israel without real provocation if their motives were good? Of course the Lebanese have been mistreated and of course the IDF went beyond the pale. But the IDF didn't simply wake up one morning and decide to bomb some completely innocent people just to show they could do it. Hezbollah constituted - and still does - a very real threat to a very large number of people. And, as I don't think anyone has seriously argued yet, Hezbollah lit the fuse to this explosion by taking prisoners and starting a fight. The result is far beyond what was expected but Hezbollah clearly expected - intended - there would be an attack. It's not as simple as Israel is wrong and Hezbollah is right or vice versa. And, of course, Hezbollah is "rolling up its sleeves" to help the people. But I don't see how that favorably affects the original decision to bait the attack. >"Peace" with an evil state like Israel is impossible. -Yeah , we have peace with Egypt from 1979 ( de-facto from 1975 ) , with Jordan from 1994 ( de-facto from 1970 ! ) . But mr. Baker thinks - that it's impossible. And so do Nasralla and Ahmadinejad . >Lebanon must deploy sophisticated anti-aircraft weaponry to defend itself and then shoot the bastards down! 1. The state of Lebanon must deploy all its power to control all of its territory and disarm all militias ( don't forget that it was part of Taef agreement ). 2. Why , for God's sake , Syria and Iran didn't supply those weapons to Hizballa , when Khyber and Zilzal missles are fare more expensive ? >Also the US Congress must stop sending military aid to Israel. -Why should they? Because it is their own interest ! Ex-PM Benjamin Netanyahu made a statement in 1996 where he told , that Israel is ready to reduce 3 BN. $ help by 50% , eliminating all the "civil part" of it , but also eliminating the article , that all the sum must spent on USA weapons only. Unfortunately , this plan was buried. "And after 35 days of conflict no one has won anything and everybody has lost." ...and isreal is still claiming it has unfinished business in lebanon. Whats their to finish besides the people of lebanon? I doubt there is any more land for them to destroy. I do agree with hcd when he said "It's not as simple as Israel is wrong and Hezbollah is right or vice versa." ...But where are you supposed to draw the line? "hcb said:But the IDF didn't simply wake up one morning and decide to bomb some completely innocent people just to show they could do it." I care--right on. Hez was created in 1983 after Israel invaded Leb. Not in 1948 when Israel was created. And Israel continued to violate airspace and kidnap after their withdrawal in 2000. I dont agree with HZ tacticts, but they certainly have a right to defend themselves and country, just as Israel, US and any other country does. -Why should they? Because it is their own interest ! Ex-PM Benjamin Netanyahu made a statement in 1996 where he told , that Israel is ready to reduce 3 BN. $ help by 50% , eliminating all the "civil part" of it , but also eliminating the article , that all the sum must spent on USA weapons only. Unfortunately , this plan was buried.""" Educate yourselves. We must not allow the lies and rhetoric to run the show in America anymore. Terrorism is the symptom, not the disease. Bush did say "Every country has a right to defend them"
Are we forgetting the Lebanese that the Israelis kidnapped when Israel first invaded Lebanon. What ever happened to them? I notice much talk about the soldiers kidnapped from Isreal. In Newsweek magazine their account of the map clearly shows Sheba. I have emailed the magazine for more info. I have found three different stories on where they were kidnapped. My family inside Lebanon always thought Shebaa. I wish to do more fact finding and find exactly where. Can anyone offer any information other than the rhetoric we hear from the media? Sincerely. I know that, I care. And Doc. I've been yelled at here a lot for saying how Bush is stupid, Cheney is pulling Bush's strings and Rumsfeld is an arrogant, miserable old man who thinks he's running the world. 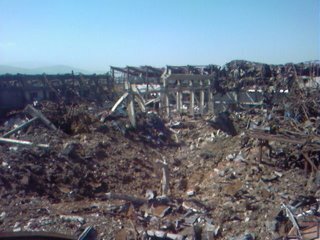 I think it is, at best, unimaginably stupid to give Israel money, munitions and equipment to bomb Lebanon and then pay 30 million dollars to evacuate americans in the middle of the bombing and now to pay another half billion dollars to rebuild what Israel blew up. All while we still can't get New Orleans fixed and we are well over the half trillion dollar mark in Afghanistan and Iraq. And, of course, that does not include the human suffering we've caused on all sides. I've also taken a lot of heat - but not so much as expected - about thinking Olmert and Prevetz are as stupid as Bush. I also take heat for saying Israel conducted itself as pigs of war in what it's done. Of course - sigh - Lebanon has the right to defend itself. My only point was that Nasrallah and his gang knew damned well there is no defense possible against what they could reasonably expect. And before you jump or sigh or express exasperation - I do NOT mean to excuse what Israel did. What I meant, very simply was that Hezbollah has NOT been gearing up for a defense mainly - to which I quickly add, they had defensive weapons and used them admirably. But the rockets are not defensive and weren't used defensively - EVER. They weren't even used for what they are designed. They simply were intended - and used - to strike randomly in the general area in which they were pointed. Hezbollah neither intended nor did "simply defend themselves and country, just as Israel, US and any other country does." Hezbollah baited Israel, used its people as bait and got a lot more than anticipated. That does NOT mean Israel is right. But it DOES mean that Hezbollah isn't nearly as pure as you suggest. Certainly Hezbollah is recently created. So what? My point about Hezbollah building the tunnels and bunkers and getting the rockets was not to say it was doing that to bait Israel. The point there was that Israel knew it and did nothing until now. It did not go to Lebanon's parliament in a bona fide attempt to clear out what Lebanon and Israel says was an unwelcome faction. But - I don't mean to exasperate or blame all of this on Hezbollah or Lebanon. It's not unlike most historical conflicts - there's lots of boiling and yelling but, finally, a hot head takes control and does something to start the bloodshed. In this case, it was TWO hotheads. It's simply that one was smarter than the other. But the other was more concerned - genuinely - about protecting his people. Israel overdid it - Hezbollah and Lebanon have the right to defend but lobbing rockets into Israel isn't defensive. Even after Israel attacked. Israel should not have taken the bait as it did. But neither should the bait have been offered. I see your point HCB, and mostly agree but remember HZ fought on the ground as much as it rained rockets into Northern Israel. I would certainly call that defense. I am also not sure if HZ would have rained rockets into nothern Israel if it knew the IDF was targetting only HZ. That was their tactic used: "You kill our civilians, we will kill yours". Eye for eye. Nasrallah even said, if you stop, we will stop. Almost all Lebanese perceived the attack as one against Leb, NOT HZ. I am NOT supporting HZ in anyway, but I do think HZ was reacting to Israel's offensive--. I dont think HZ intentions are pure either. They have their own agenda, and certainly do not represent Lebanon and its govt to the extent that the IDF represents Israel. But to deny them the right to defend themselves is ridiculous, to say the least. Now, why in the world would HZ want to bait Israel in that way? I honestly dont think Israel's reaction was expected (although maybe it should have been). HZ has kidnapped soldiers many of times in order to exchange for their prisoners. Nothing new here. HZ strategies were not new. Only Israel's reaction was unexpected. Know that I care.... Ya about your viwe and to hell with anyone elses view point. Weren't you a baby killer yourself? Keep telling people you care, maybe one day some will care about you. I agree - I think HZ was surprised. I also think the US was surprised (although, I have read the Hersh article a couple of times) Either way, it seems to me the real problem is one of ego. In the past couple of weeks I've read until I'm blue in the face trying to understand all the interplay and I can't make sense of it except to say it makes sense because that's the history of the area - similar to the Balkans. I also think there is a problem that neither Israel nor the US has recognized, much less grappled with. We keep talking about "rules of war" and the like as if we are in some kind of modified Clausewitzian world. But that kind of war proceeds on the trinity of People-Government-Army. It requires that the government be the sole instigator and wager of war with the army doing the fighting FOR the people. Thus proceeds "civilians" or "non-combatants" and the "rules of war" (which Clausewitz dismissed as silly) Hezbollah is not a government and its "army" is not an "army" in the sense of being formed by a government to protect the people. So - there really are NO "civilians" or "non-combatants - it is a popular force rising up against Israel. On the other hand, Israel is a government with an army for the people. There are civilians and non-combatants. Same with the US. So - we argue for "rules" and Hezbollah says, "what rules?" Until it's propaganda-wise to apply them. And then the world beats up on Israel for attacking "civilians" and Hezbollah says "yeah." And Israel and the US stand there trying to wipe the mud off their faces by explaining the HZ is "hiding behind civilians" and therefore .... But the fact is, the "civilians" invite and succor the fighters. There's nothing wrong with that, of course, but they are not "non-combatants" in the sense they are being portrayed. They are not complete innocents who are being targeted indiscriminately. That doesn't mean it's right to bomb them - but it's also not right to say, "war crime because you're bombing civilians." And, of course, we could talk about Dresden and Berlin and Tokyo and Manchuria and Nanking and so on ad nauseum. Nazrallah is fighting a war of wits to Olmert's war of might. We could analogize it to Ho Chi Minh but I'm afraid there would be even more yelling at me. Nazrallah is saying, simply, I want to "win" but I don't have an air force. What to do? Well, make them do something stupid and the world will come down on them and beat them up for me. Same thing that was said by the North Vietnamese in Paris. And by Ho Chi Minh. And by Arafat - "you are talking soon. We are talking about, maybe, 200 years." If people keep yelling and pointing fingers and shooting - it will never end. Maybe it won't anyway. But it for sure won't until everybody at least understands what really is going on. And I don't think either side knows that much about the other. Which means both sides are dealing from hate, fear and confusion. HCB--Yes, Nasrallah is much smarter than we thought, however, again, he did not expect or anticipate this reaction. He used the power of propaganda and media to support his cause AFTER the initiation of the conflict, but did not purposely plan the kidnappings to invoke Israel's reaction. I think he is too smart for that. BTW, War crimes were committed not for targeting civilians only, but the country's infrastructure, economy etc. I agree, HZ are in essence civilians who also serve as militia-men. And HZ do have families/friends/neighbors that do support them who may or may not get inadvertenly and unjustly killed doing so. Doesnt make IDF right, and they should have known going into it (with all their "intelligence"), that that was the nature of HZ. They behaved as if HZ was an normal army, went after Leb as a whole (economy, infrastructure) and proceeded to attack in this manner. So I do believe HZ's reaction was warranted. HZ may not come from the government, but the do serve as a proxy for the govt in terms of social services and defense. So they do represent the people, if not officially. Not all countries function in the same way as US/Israel. You said: "On the other hand, Israel is a government with an army for the people". I say Israel serves as an army with a state, not a state with an army. Keep shooting, know one cares anymore. Your part of the world doesn't make the headlines anymore. then why do you remain on these blogs? Oh I'll agree HZ was unprepared for a full scale war on it - AT THIS MOMENT IN TIME. But it was arming with long range missiles in anticipation of that war sometime in the future - they sure weren't gardening tools. The fact Iran supplied them with it, and the other obvious Iran backing, indicates they were all planning on a future full scale war - possibly waiting to the day Iran would achieve that nuclear bomb they are working on so hard as we speak, to arm those Zilzals with a little something extra. Who would like to draw that picture for me? Iran vs. Israel (and possibly the US and Europe) with nuclear weapons - what do you think that would leave the Middle East, and the world for that matter, looking like? Nasrallah anticipated a war, just not now. Maybe Olmert also anticipated Nasrallah's war one day (this is probably what everyone is regarding as "a planned operation" - its not the Israel planned starting a war in summer 2006, but it estimated a war would one day erupt at the hands of one entity or another). Maybe it was obvious to everyone but us regular civilians that the situation was inevitable. I guess someone, probably Olmert, prefered to take advantage of the chance Nasrallah provided now - maybe hoping to end things with HZ on a smaller scale, before Iran was armed with that nuclear bomb. I imagine this was the additional agenda leading to all the unneccesary violence on civilians, and the reason for the US backing (avoiding a bigger conflict with Iran some day). There was alternative ways to go about it, which unfortunately Olmert ignored, and that is true - he apparently picked the wrong scenario and ultimately, we probably failed at the task of getting the final war with HZ over with before it could get bigger. From the way things look right now, I think it is still coming. But to me, it is clear HZ was preparing for a definite final war some time in the future. This war would of course result in the demise of many Lebanese civilians, as well as Israeli (not that HZ care about that), if not other neighbours like Jordan, Syria and Egypt. This shows Nasrallah's regard for Lebanese lives - as long as they serve his purposes, they are fine alive, but once he has a chance he will not flinch at sacrificing them for his own agendas. Yes, HZ is doing important social work. But they their main agenda is not a humanitarian one - it is defeating Israel into the ground. This has been clearly stated time and time again. Their social aid, frankly, is a danger - because they are doing it mainly to gain support, not out of their bleeding hearts for the poor civilians. HZ is alot more than just a southern Lebanese organisation, and this is about alot more than defending south Lebanon from Israelis. The signs are quite obvious. i care...respect for being one of the few that really understand whats going on. it was reported in the press. Israeli government officials said on condition of anonymity"
Israel, where an Israeli unit had penetrated in middle of morning." eight Israelis and wounded over 20 in attacks inside Israeli territory. " inside Lebanese territory, only to swiftly change their story a few hours later. Hizbullah attacks on IDF forces along the northern border. " unfolded. UNIFIL and UNTSO most probably know exactly what happened. Carmel, Lilu, Jaeger - this is what I mean. No matter the argument, there simply is no way to justify this. Since you mentioned me specifically hcb, I suppose I'll take a crack at responding. What do we know about how Hizb'Allah gets its weapon supplies? Not much, but when Israel blockaded the ports and airports everyone objected, saying that it was obvious Hizb'Allah would never ship weapons that way - They would be delivered by road through the Bekaa and then delivered to the south. Okay. I presume the trucks and warehouses used aren't labeled "HZ Missile Resupply" in large Hebrew letters, so Israel is obliged to use surveillance methods to try to discern which of those regular civilian warehouses and trucks would be used. What do we know about this bottling factory? 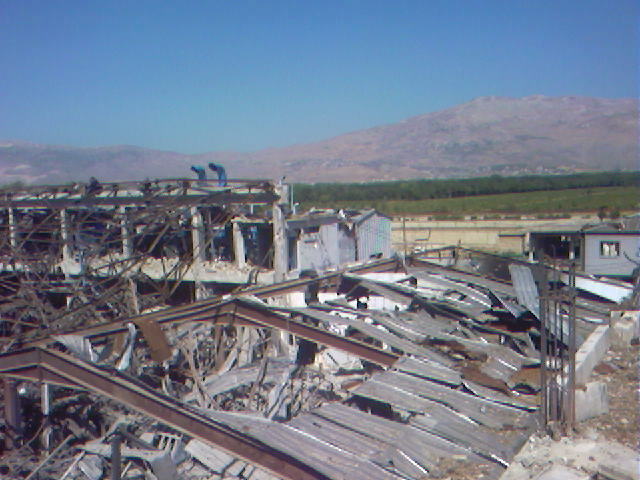 It is one of Lebanon's largest exporters to the Middle east in the heart of Hizb'Allahland on the highway to Damascus. As a regular part of its business it has heavy truck traffic to Syria, and presumably to stores and warehouses throughout Lebanon, including the South. Now what would make Israel think that such a business might be useful to Hizb'Allah to smuggle weapons? Posters here seem to think it is stunningly obvious that Hizb'Allah would be resupplying their fighters using methods other than warehouses, factories and trucks like this one. Okay, you know the environment there better than I do and let's take Mr. Chowdury at his word that his business had no dealings with Hizb'Allah. What target in the Bekaa or for that matter anywhere else in the country would you agree, yeah, Hizb'Allah was likely using that to store, hide, ship, and fire weapons at Israel? I think we've established that ports, airports, roads, bridges, warehouses, factories in the Bekaa, trucks, cars, appartment buildings and houses in the South are obviously civilian targets that Hizb'Allah would never use. So in fighting back at Hizb'Allah what is a legitimate target? Thanks, Jaeger. The important point is your question - "what is a legitimate target?" I think the answer depends on the goal. As to the specific bottling company target, I heard nothing about secondary explosions or anything else that would indicate there was something like rockets or other explosives in the plant. Nor have I heard anything from the Israeli Air Force about, "Well - the reason we bombed it was ...." One of two answers comes to my mind: It was a mistake along the line some Israeli General suggested about Qana. He said it was the same kind of thing that happened when the US bombed the chinese embassy in Iraq. However, it looks like a pretty big building - the biggest thing in the area. It would be hard to accept it was a mistake. What I REALLY think was the idea was to make southern Lebanon unattractive for return. Israel (oooops, sorry Lilu) Olmert blew up gas stations, roads, factories, houses - everything. And, as we know, the Lebanese were warned to get out first. So - get the people out because they really are not a legitimate target and it will be really bad if they all are killed. But find a way to keep them from coming back - so there is a buffer zone without having to occupy it. Let the people move to Syria or Beirut or anywhere other than south Lebanon. If that was the goal, then the bottling plant is a "legitimate" target - everyone in the world may disagree but no matter what one side blows up, the other side is not going to like it. Destroying the infrastructure is "legitimate" for the same reason destroying Tokyo was "legitimate" - it advanced Allied goals in the war. The trouble with the bottling factory, I think, is that it was not legitimate in terms of advancing a real purpose that would benefit Israel. It makes Olmert and his Air Force feel good but what did it do for Israel. Let's say there were a thousand missiles in it. So what? They come out when the tanks roar in - HZ is not going to be able to move them. And, if they try to, the drones or helicopters or forward air controllers are going to stop it. ALL that was accomplished by that strike was those awful pictures. And that is a disaster for Israel. Olmert and crew compound the disaster when they try to show it was or might have been something used in the war effort by HZ. People are already jaded because the US tried so hard to show a baby milk manufacturing facility really was making poison gas or bugs or something nefarious. And the trucks were rolling biological warfare manufacturing plants. Israel did what the US did - relied on technology for intelligence. And got spoofed. And now Olmert is trying to rationalize the irrational. Anonymous, I am dying to hear what you are really trying to imply there (care to elaborate?). I think I can track your post there to the following link: http://www.whatreallyhappened.com/israeli_solders.html. Am I right? The paranoid conspiracy site What Really Happened is your reliable source? On Sunday, 06/18/2006, Udi and Eldad were called up for reserve service on the northern border. They were meant to serve 28 days. The service was to include security patrols along the border and other security tasks for the defense of Israel's northern settlements. Wednesday morning, 07/12/2006, was the last day of their service. Udi and Eldad packed their things and prepared to go home immediately after their last patrol. The patrol included two vehicles, Humvees, that advanced parallel to the border fence from west to east, from Zar’it to Shetula, within Israel's sovereign territory. Udi was sitting in the right front seat. Eldad was sitting right behind him. Nothing out of the ordinary happened until 09:05, at which time the Hezbollah heavily bombarded the whole region. This turned out to be a diversion for the planned kidnapping of the soldiers. At this point the Humvees were in a passage in the wadi, when they were suddenly attacked by a group of Hezbollah terrorists. The leading Humvee in which Udi and Eldad were riding, was hit first by anti-tank RPG missiles. The second vehicle, 50 – 60 meters behind, reported by radio the hit of the first vehicle before it, too, was hit directly by two anti-tank missiles. The three soldiers in this Humvee were killed. After the strikes, the terrorists opened fire from lighter weapons in the direction of the wounded soldiers and the damaged vehicles. The driver of the first Humvee managed to stop it and to climb out, taking with him the wounded soldier sitting behind him. Under cover of the firing, Udi and Eldad were kidnapped and taken to Lebanese soil. It is unknown whether they managed to climb out of the vehicle before they were kidnapped. Nor is it known how hurt they were. Footsteps, bloodstains and a hole in the fence were found at the scene. Immediately after the incident the first attempt was made to locate Udi and Eldad. Four additional soldiers were killed during this attempt. This chain of events led to the beginning of the fighting in the north. That is the detailed description of the event you will find everywhere reliable. It includes a map of where Zar'it and Shtula are - in the central part of the northern border (northern Galilee). Shebaa, as I recall, is way way to the east from there. So, no, the abductions did not take place in the area of Shebaa - the 2000 abductions took place closer to that area, as well as a failed abduction attempt in 2005 and also a kidnapping of two Israeli Arabs from nearby Ghajar. The village of Aita al-Chaab is close to the area of Zar'it and Shtula, but a few good kilometers into Lebanon. The nature of border patrols is to take place along the border fence, on your own side. It is also the time to mention the soldiers were standard reservists, which on routine non-war days usually take part in the most routine assigments, they are not in full active duty and therefore less qualified for special ops and things as such. Peace/cease fire time operations across enemy borders are usually reserved for special forces units. I really don't know why those analysts were so puzzled. It is common knowledge first media reports are usually sketchy and inaccurate - they are publicized right when the incident occurs if not during, so it takes time for the accurate and full details to be verified - especially regarding military issues, when everything is still censored for security reasons. It should also be mentioned armies have this weird habit of training their forces in certain scenarios, especially scenarios which have occured in the past (with failure and casualties) and are a known and still viable threat. Like, say, a possible scenario of soldier abductions (which have occured succesfully in the past, as well as recent failed attempts at it). They even have the strange tendency of practicing new strategies for such scenarios (couldn't imagine why). But you may be interested to know that I've heard the strategy they practiced in training was actually very different than what proceeded to occur - the exercise was about forces parachuting deep into Lebanon and moving south towards the border, to close in on HZ forces and prevent them from escaping north. Instead, the IDF invaded Lebanon from the border, moving north, with the parachuting of soldiers eventually happening much later into the campaign, when alot of other options were exhausted. It has been implied that had they carried out the strategy they practiced in the training exercise, the war would have been over much faster and with greater success to IDF forces in stopping HZ - another question mark for Halutz. As to the specific bottling company target, I heard nothing about secondary explosions or anything else that would indicate there was something like rockets or other explosives in the plant. I have heard nothing to suggest that either. Let's take Mr. Chowdury at his word and assume his business was never used to smuggle weapons for Hizb'Allah. That would leave the possibility that whatever intelligence Israel had about the factory was mistaken. So what could lead to a mistake like that? The article claims the factory ceased operations on Aug 1st and was hit Aug 4th. Since the war started on July 12th that means the factory continued operating in the heart of Hizb'Allahland for more than two weeks - presumably with the required truck traffic shipping supplies in and cases of bottles out. Continuing that kind of operation while trucks are getting hit on the roads and bridges are being knocked out might make surveillance think there's something more valuable being shipped around than bottles of tonic water, even if there's not. This is one of the hazards of depending on a guerilla army for your defence. Even if the enemy has the best of intentions they will inevitably hit all kinds of mistaken targets. And if they don't have the best of intentions they'll just indiscriminately flatten everything, just in case. If Israel were hitting bottling factories in Tripoli I think we could claim with some confidence that they were just inflicting economic damage. But if Hizb'Allah is not shipping weapons from Syria via civilian businesses, warehouses and factories in the Bekaa, how are they getting weapons to the south? Lilu said"Shebaa, as I recall, is way way to the east from there. So, no, the abductions did not take place in the area of Shebaa - the"
So why did Newsweek report and show map clearly stating this is where the soldeirs were kidnapped from? Why should we beleive the Isreali account of what happened ~ they have certainly been known to change or hide the truth. Either way, I wish to know the exact spot from a very reliable source. Isreal history proves it is not a reliable source. Yes, Jaeger - it leaves that possibility. However - if it was a "mistake", will Israel rebuild it? Along with the gas stations that were "mistakenly" targeted as ... what? And the roads? Why is there STILL a blockade? Does Israel really think the rockets are coming by air to the airport? Or that Hezbollah is using all the oil that comes into the country? Even if it does think those ways, does Israel really, in good faith, claim a right to destroy those facilities and others so they can't be used by other Lebanese? By the way, was there ever a declaration of war by Israel? Against who? No, Jaeger, the target was the economic viability of the area. That's also why cluster bombs were used in "civilian" areas. There was a post about a week ago concerning an article indicating the area was being seeded with mines dropped with bombs. I doubt that - I certainly hope Olmert would not be that evilly stupid - but if cluster bombs really do have the dud rate I suspect, then they are very effective mines. Their real effect comes from the fact they MAY be there and they can be claimed as "unintentional but unavoidable." Sort of like the "unintentional but unavoidable" "mistakes" or "collateral damage" resulting from bombing. People now think there are unexploded munitions and shy away from the area. Some don't think that way and a couple of those find some. There is absolutely no way to know how many there are or might be. Couple that with the complete devastation of the infrastructure and residences and the south becomes a "buffer zone" and Olmert doesn't care a bit what people think because he'd gotten what he intended. The bottling factory was an intended target. It was not a "mistake" in any sense. 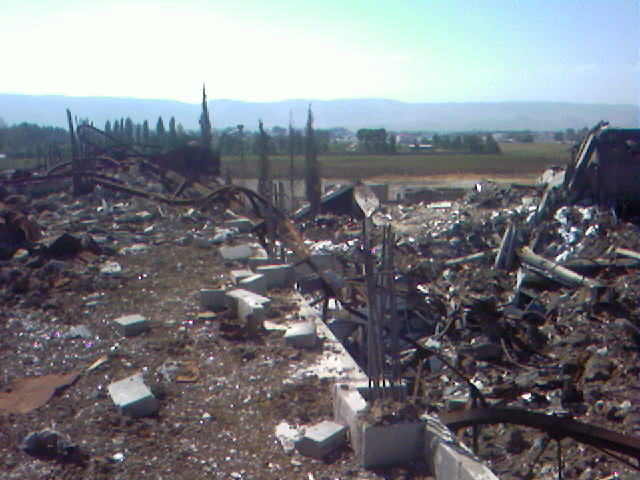 The intention was to destroy absolutely any hope of a life in that area of Lebanon. The intention was to destroy all means of conducting business, all places to live and all hope of ever returning because things left behind might blow up or Israeli warplanes may suddenly again appear without warning. It is the darkest, most evil response imaginable to the evil worked by Hezbollah. It is "MAD" - mutually assured destruction invoked by only one side. There are SO many other things he could and should have at least attempted before creating this horror that is completely inexcusable and can never be justified. It accomplished absolutely nothing - nothing good for Israel, nothing good for Lebanon, nothing good for the imagined "war on terror." But, look what it DID do for Israel: it makes every Israeli appear as an out of control bully who feels it appropriate to wreak this kind of destruction. And, by continuing the attempts to justify it, the appearance is the bully thinks it can do so with impunity - without any accountability at all. That's worse, even, than the US when it goes on a rampage. The Lebanon fiasco couples the US and Israel as terrorists on a scale far greater than Al Qaeda and Hamas and Hezbollah combined could ever in their wildest imaginings become. 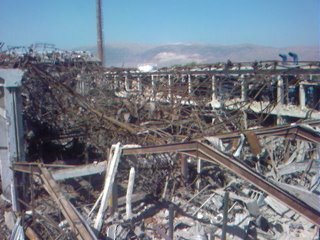 Compare south Lebanon to the 9/11 attacks. Compare it on any scale you think appropriate. Lives taken, buildings destroyed ... whatever. The only real parallel is economic. As a result of the attacks, we have spent at the least, one trillion dollars. Half a trillion so far in Afghanistan and Iraq alone. We hired 30 or 40,000 people right away to go through your carry on at the airport because you might be a bomber. Couple that with what goes on in Palestine. And Iraq. And Afghanistan. Then look at the results. Israel is in even greater danger than it ever was. The United States is so paranoid it is reacting willy nilly to every possible hint the bogey man is coming. Ignoring the human tragedy of Iraq and Afghanistan, we have spent an unimaginable amount of money in five years on idiocy. With the result we are pariahs bumbling around trying to show how hard we are working to "defend" ourselves while the United States tries to impose "democracy" on the rest of the world. What to do? Israel and the US have a knack for making themselves completely misunderstood to the point they look foolish as well as evil. Now what should happen is the attempt to figure out what SHOULD be done - either kill every person in the entire world who doesn't like Jews or Christians OR think of a way to live with them. It's that simple. Either we get along or we make every single person who doesn't like us dead. And "get along" doesn't mean love or mingle or intermarry. It means, simply, we can travel from one place to another in the world without worrying about being taken hostage. It means being able to go to the pizzeria in Tel Aviv or the beach or down your neighborhood street without worrying that the person next to you on the sidewalk or the bus or at the table is suddenly going to blow up. How? Well, at this point it's pretty clear how not to do it. Start by going to the Knesset and telling the ultra conservatives to "shut up." Put a leash on Netanyahu. Get Bush back to his ranch and give him a chain saw and a pile of blown down trees to clear. Take Cheney somewhere and shoot him. And get some thinking, compassionate people in places of importance - people who aren't quite so blood thirsty AND stupid. how predictable of you, i care.. really, are you kidding me? I haven't seen the newsweek article so I don't even know what you're talking about, you are welcome to email it to me if you can and I'll try to see what that is all about. The description of events as they are known come from the military status reports of the incident, which included the evidence of the soldiers and commanders involved. They are the only people that you can get detailed information from, save for the HZ soldiers that physically took the soldiers go find them (oh and HZ has proven to be such a reliable source, they NEVER change or hide the truth..) - the people at the scene would be the only ones who know what happened. If you're so desperate for an eyewitness account, contact the IDF spokespeople to get you in contact with the unit, or go find the HZ kidnappers (good luck with that one). No one would object if you found the kidnapped soldiers themselves too, try asking them. But it seems to me you've already made your mind up about what happened, reliable sources or not. You're not interested in finding out where the kidnapping really took place, you're interested in finding someone who will tell you it was in Shebaa - I imagine they would immediately be regarded by you as a reliable source just for letting you hear what you wanna hear. Israeli history does not prove it is not a reliable source, not anymore than any other country and/or source - unless you are already biased. The truth hurts some time, friend, I would suggest for your own sake you start opening your mind up to accept things that are sometimes unpleasent to hear and don't coincide with your point of view. The world's full of them. Surely Israel know by now what's like in the middle east: The more you attack arabs (ie palestinians or hezbollah) the stronger they become. And while Israel could have so easily chosen to downplay the hezbollah attack as it has been doing for so long, could it be perhaps that Israel doesn't want peace with arabs - as a finality, especially after seeing them launch an attack against Lebanon, even after they have agreed to a cease fire. I mean we all agreed to a cease fire.. WHY did they break it.